As the war for instant messenger heats up, Yahoo has upgraded it popular Yahoo Messenger to Yahoo Messenger 11 beta 1. 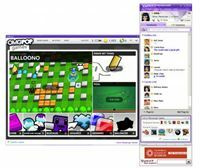 The new Yahoo messenger 11 beta 1 has been incorporated with lots of new features, including social games such as Fishville, Mafia Wars (Coming Soon), Balloono, Pool, Draw My Thing, Happy Harvest and Happy Manor, and directly connect and manage social networks like Yahoo! Pulse, Flickr, Facebook and Twitter. Keep up with friends wherever they are – view, comment on and like updates from Yahoo! Pulse, Flickr, Facebook, Twitter and more from one place within Yahoo! Messenger. Post one status to multiple social networks – share Messenger status simultaneously on Yahoo! Pulse, Facebook, and Twitter. Chat with Facebook friends – in addition to your friends on Windows Live, you can now IM your Facebook friends right within Yahoo! Messenger. Enjoy rich experiences across devices –-make free video calls, share photos and videos between PC, iPhone and Android. Converse virtually anywhere – start IM conversations on PC and continue them from iPhone, Android or any Internet-enabled device. Always be available – stay signed in to multiple PCs simultaneously for never miss a message. Easy access to recent conversations – retrieve recent IM conversations from any PC where you have signed in to Yahoo! Messenger. The Yahoo Messenger 11 Beta in setup loader form of Yahoo! Messenger can be downloaded from http://messenger.yahoo.com/beta/win. Those who prefer the full version standalone offline setup installer for Yahoo! Messenger 11 Beta v11.0.0.1751 can directly download the ymsgr1100_1751_us.exe.